Weekly Innovation: Paper Notebooks That Become Digital Files : All Tech Considered This week's innovation pick marries good old-fashioned notebooks with digital storage options. 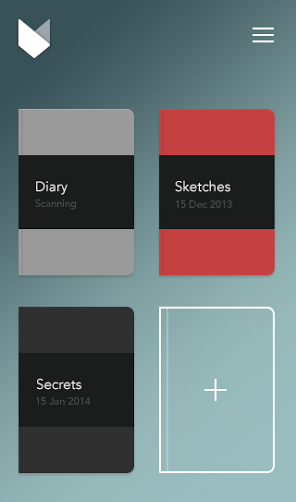 That way you can keep your ideas and sketches in the cloud and access them when you need them. Each week, we highlight an innovation you might not have heard of yet. This week's innovation is a twist on something invented thousands of years ago: paper. The St. Louis-based team of Marshall Haas and Jon Wheatley are selling classic, quality-made hardbound notebooks. But there's more. After you finish taking notes in their Mod Notebook, you mail it to the company using a prepaid envelope found in the notebook's back pocket. All of the pages in the notebook then get scanned, digitized and uploaded to a Mod app and — if you wish — your Evernote, Dropbox or OneNote accounts. "We love paper, we love digital storage, and this bridges the two worlds," Haas says. Why create a paper-based product in an age of apps? The founders say their hunch is that there's still something attractive about the tactile experience of handwriting on paper. "And it's not just writing," Wheatley says. "It's [for] people who sketch out things, lay out designs. There are app equivalents of these things but they're not quite there yet. It's not the exact same thing. You can get a stylus and iPad drawing app. But it's a lag — not quite precise. At the same time, it's 2014 and everything's digital. So this bridges the gap by giving you both." The notebooks just launched this week, so the OCR function, which will allow for users to digitally search their scanned, originally handwritten notes for certain terms, isn't ready yet. But that's next on the feature list. For now, the notebooks sell for $25 each and include the shipping and digitization costs.